For more than half a century, Community Health Charities (CHC) has represented the most well-respected health charities in our country. These charities, of which The ALS Association is a proud member, must meet stringent criteria in order to be accepted, ensuring a cost effective partnership that enhances the ability to deliver more of every dollar donated into the hands of those who desperately need it. Through its nationwide network of 36 affiliate offices, CHC effectively connects the American workplace to credible charities focused on addressing our nation’s most pressing health issues. Giving in Your Workplace Couldn't Be Easier! Workplace Giving is an easy way to support The ALS Association Michigan Chapter. Your gift supports patient service programs and nearly 80 research projects throughout the world. Giving at work through payroll deductions is simple and there are many convenient ways to contribute. As a member of Community Health Charities (CHC), we are one of the voluntary health agencies participating in the CFC. 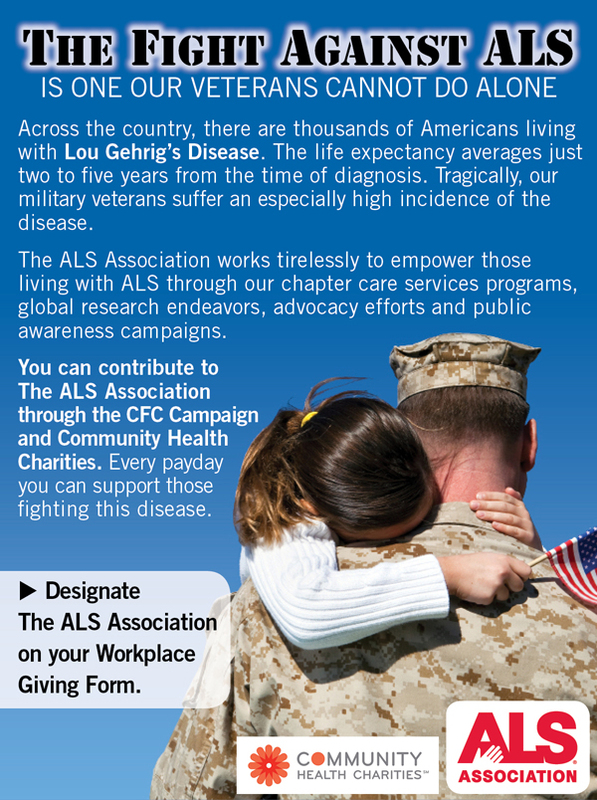 Federal government employees are encouraged to participate in the CFC and may designate The ALS Association Michigan Chapter by writing The ALS Association - Michigan Chapter on the Workplace Giving Form.